The Samsung Galaxy Nexus is equipped with a 5MP camera that snaps photos with a maximum resolution of 2592x1944 pixels. It's partnered with an LED flash. The user interface has been reworked but we're still not big fans of it. It sure is functional and custom camera interfaces can learn a thing or two from the Galaxy Nexus' camera, but it could have been executed better. The viewfinder takes up most of the screen, with a panel to the right of it for some of the controls - the gallery shortcut (which is a thumbnail of the last photo taken), the virtual shutter key and the camera mode switch. The switch works like this - you tap it, it extends and presents you with three options (still camera, video camera and panorama). The rest of the controls are overlaid on the right side of the viewfinder. They are the front/back camera toggle, a virtual zoom slider and the settings shortcut. The setting shortcut brings out options to control the flash, white balance and exposure compensation, scenes and finally, more settings (only geo-tagging and photo resolution options are available here). Tap focus is also available if you want to get creative with your framing (i.e. the subject isn't in the center). Face detection is also available too. When you tap the Gallery shortcut it opens a preview of the last photo taken with a list of all ways to share it and another shortcut to get into the regular gallery mode. Panoramas are easy to shoot - you just hit the shutter key and start panning left or right, the phone will take care of the rest. It will warn you if you're going too fast, but has no problems if you keep it in place for a while (unlike, say, Sony Ericsson's solution, which fails if you move too slowly). One thing that did impress us about the Galaxy Nexus camera was the shot-to-shot time - it was nearly instantaneous, you could just tap the virtual shutter key repeatedly and the phone will snap a photo. As far as image quality is concerned, the Galaxy Nexus is an excellent performer. Resolved detail is on a really high level, colors and exposure are spot on and noise levels are kept under control. 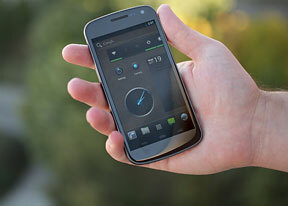 The Samsung Galaxy Nexus enters the skirmish over in our Photo Compare Tool. The tool’s page will give you enough info on how to use it and what to look for. The synthetic resolution chart (the first one) looks really clean. The second chart shows well-behaved noise reduction algorithms (the patch of grass and the patch of gravel are still recognizable) and the color patches are accurate. The third chart also shows good performance in terms of detail and color rendering and there's no visible color tint in the black and white part. Despite being saddled with a 5MP shooter, the Galaxy Nexus still manages to do 1080p video. The front camera shoots 720p videos. The interface is practically identical to the still camera interface, but there are some really cool features available. The first is the option to take full resolution photos while recording video - you just tap on the screen. This way you get the best of both worlds - the whole event captured on video and the extra resolution you get from the 5MP photo. You can use the digital zoom while recording video too. Other options include real-time effects that modify a person's face for comedic effect and there's a time-lapse video option too (with shots taken every 1 to 10 seconds). A curios effect that doesn’t work very well is the Background feature. You set up the phone on a tripod (or something else, as long as it's perfectly steady) and when the phone is ready you get into the frame. The software will do its best to cut you out of the background and put you on one of three predefined backgrounds or on a video of your choosing. Unfortunately, it's very sensible to changes in the picture - even if you cast a very subtle shadow on the wall behind you, the effect isn't accurate at all. And the background has to be perfectly static or it will peek through, so it’s no Hollywood-rate green screen effects but good for a quick laugh. Note that resolution for such videos drops to D1 (720x480) and the framerate hovers around 16fps. On a different note, the FullHD videos captured by the Galaxy Nexus are shot in MP4 files with a fairly low bitrate of just under 10Mbps. The framerate is 24fps, which is lower than most of the competition, but looks good enough. Even with less than the ideal framerate, the 1080p videos produced by the Galaxy Nexus are top-notch with correct exposure, good colors, and excellent resolved detail. 720p videos are shot at a slightly lower bitrate - 8Mbps - but the framerate goes up to 30fps so they are smoother. What's more, the camera field of view is wider in 720p mode. Quality is again pretty good. You can grab this 1080p@24fps sample (11.9MB, 0:10s) and this 720p@30fps sample (10.3MB, 0:10s) directly to see the quality up-close without extra YouTube compression. We also shot a 720p sample with the video call camera. It does 720p@30fps with 8Mbps bitrate too, although (expectedly) the quality of the videos is much worse than the ones shot with the main camera. Still, they look pretty decent, considering the quality of most front-facing cameras. By the way, you can use the same fancy effects with the video call camera as you can with the main camera. The Samsung Galaxy Nexus is among the several phones in our Video Compare Tool database that can record 1080p. The Tool’s page includes a quick walkthrough on how to use it and what to look for. Under good lighting conditions, the videos have decent detail, although the combination of noise and compression take a lot of that away. In poor lighting however, the results are pretty poor. As far as synthetic resolution goes, the Galaxy Nexus does very well. There are no signs of artifacts, which is good too.